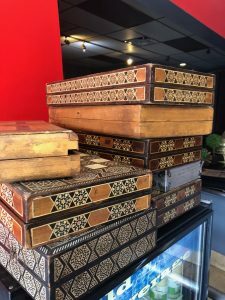 There are two very Middle Eastern things about the stretch of Sawtelle Blvd. in West Los Angeles known officially now as Sawtelle Japantown. One is secret, one better-known, both are hidden in plain sight. First, there’s Café Dahab, at the corner of Sawtelle and Santa Monica Blvd. Since 2001, Café Dahab has been a homey, traditional Egyptian restaurant-slash-café-slash-hookah lounge. It is the place most people pass on their way to Sawtelle’s sushi, ramen, dumplings or cutlet outlets. 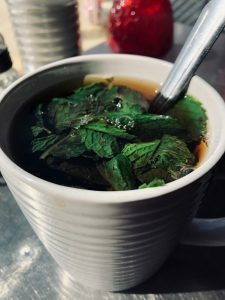 The crowd at Café Dahab is mostly Arabic-speaking, young people flirting across clouds of fruit-scented smoke, older couples and families swiping hummus, or digging into the house specialty molokhia, a long-simmered soup with chicken and the slightly slimy leaf vegetable called mallow. What’s the less delicious secret? About five blocks south of Café Dahab sits the Consulate General of Saudi Arabia, at 2045 Sawtelle Blvd. The hipsters who throng Sawtelle in search of the next great ramen will never notice the Consulate, even as they hang nearby for a seat at Killer Ramen. There is no sign. Thick ficuses shroud the green slate entrance, and the actual door is recessed from the sidewalk. The guards hang back inside. It’s a big, shadowy building, the kind you can imagine going into, and yes, never coming out of. On Monday, after some fresh mint tea and lunch at Café Dahab, I drove down to the Consulate, pulled out a photo of Jamal Khashoggi, and tacked it to the telephone pole just outside the consulate’s front entrance. My picture of Jamal Khasshogi outside the Saudi Arabian Consulate on Sawtelle Blvd. My hope is that when the employees make their way in and out of that building, and when drivers pass by, they will understand that we will neither forget nor forgive what Saudi Arabia’s leader did to the journalist. On October 2, Saudi security forces, undoubtedly acting with the knowledge of Crown Prince Mohammed Bin Salman, murdered Khashoggi during his visit to the Saudi consulate in Istanbul. Khashoggi was the Washington Post columnist and American resident who wrote critically of the Saudi regime, and courageously about the need for reform in the Arab world. He entered the Saudi consulate in Istanbul to get papers for his upcoming marriage, and he never emerged. After lying and changing their story numerous times, the Saudis now admit he was killed inside the Consulate, but, they say, it was a rogue act by disobedient operatives. 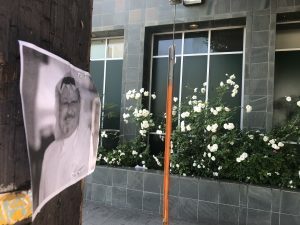 The Saudis can try to hide their Los Angeles consulate, but they can’t hide the truth that they tried to silence a journalist by killing him. And they tried to intimidate living critics into silence by murdering him in a brutal, bloody way. I do hope that others who care about Khashoggi’s murder blanket the entrance to their consulate in momentos, until the Trump Administration metes out appropriate justice for Khashoggi. When the Saudi regime can’t extort cooperation with its oil money, it extracts obedience through violence. That’s why it has long funded its retrograde version of Islam in countries from the United States to Pakistan. That’s why it oppresses dissent within its own borders. That’s why 15 of the 19 9/11 terrorists came from Saudi Arabia. And what many people do not realize is that hidden consulate on Sawtelle played some nefarious role in those attacks. In early 2000, two Saudi nationals arrived at LAX via Bangkok. Their names were Nawaf Hazmi and Khalid Mihdhar. At prayer services at the Saudi-funded King Fahd Mosque in Culver City, they met Fahad al-Thumairy, an official at the Saudi Consulate on Sawtelle who led prayers at the mosque. Later, Al-Thumairy sent a Saudi defense worker named Omar Bayoumi to meet the two visitors. Bayoumi set up Hazmi and Mihdhar in an apartment in San Diego and found them a flight school. Just over a year later, the two men boarded American Airlines Flight 77, and flew it into the Pentagon. After the attacks, al-Thumairy flew back to Saudi Arabia. In February 2004, members if the 9/11commission questioned al-Thumairy in Saudi Arabia about his ties to the hijackers. That’s one legacy of this hidden building on Sawtelle, in what– pardon the pun– is otherwise a food Mecca. Café Dahab is perhaps the most curious restaurant on the street, the Middle East place in the midst of the Far East. It is homey and comfortable. The TVs are always tuned to Egyptian music videos, soccer or soaps. The staff will let you know when there’s fresh watermelon, and serve it alongside feta cheese if you ask. In a town whose best chefs are now constantly refining Middle Eastern food, Café Dahab offers far less pricey, simpler versions of baba ganouj, hummus and a very Egyptian falafel that uses fava beans rather than garbanzos. 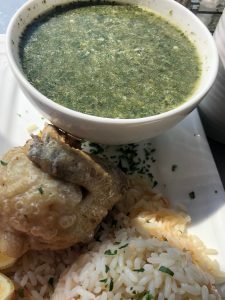 The best things on the menu are the most Egyptian: That molokhia is a bowl of bright green soup, which starts warm, peppery and somewhat acidic. When you swallow, the pureed mallow cools everything down. It is deeply herbal, the taste of some foraged green, with a smooth, butterfat-like texture. On the side there will be a bland oven-roasted piece of chicken piece and some condiments. My suggestion: tear the chicken into the soup, squeeze in the fresh lemon and stir in the diced tomato. We think of Middle Eastern cuisine as hot weather food—Dahab is the name of a famous beach in the Sinai peninsula. But winters can be cold there, and there are many soups and even desserts perfect for keeping away the chill. 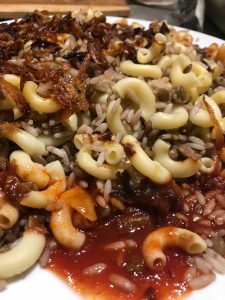 Molokhia is one of them, and so is koshari, the everyday Egyptian vegetarian dish of lentils, rice and pasta served with thin tomato sauce and a heap of crisp-fried onions, all of it aromatic with cumin. Order it with the stewed okra, or bamia, and let the two mix and moisten each other as you scoop them up. There are kebabs, laced with garlic and parsley and lightly charred on the grill. For under $20 you can order a three-skewer combo. Do that, along with an array of salads and one or two Egyptian stews. Eventually the table will fill up with too much food and too many plates, but no one’s in a rush at Café Dahab. Desserts include the expected baklava, along with Egyptian specialties that are more rare, at least in these parts. That includes a thin, sweet sahlab, a pudding made from the tuber of an orchid that is the Middle East’s go-to cold weather treat. There’s also eish el soyara, Egyptian palace bread. Imagine a bread pudding studded with pistachios, dripping with sugar syrup and fragrant with rosewater. There is no alcohol served at Café Dahab, in accordance with Islamic law. Of course, that same Islamic law also takes a dim view of the murder of innocents. The revolution in faith that the Prophet Muhammed brought to warring desert tribes realigned their loyalties to a universal morality, and preached the sanctity of all life. The laws of justice and compassion in Islam apply even to rulers, even to the Prophet himself. “There is no obedience in sin,” Muhammed said. The faithful should follow their leaders, unless those leaders act unjustly. Maybe if enough people put ribbons, candles and photos in front of the Saudi consulate, the good people of Saudi Arabia will see justice done in the name of their country, in the name of their faith, and in the name of Jamal Khashoggi. I’ve eaten at Café Dahab numerous times over the past five years. As usual, these reviews are completely independent. I never accept free meals or promotional consideration. Since the death of Jonathan Gold and the collapse of the LA Weekly, there aren’t enough weekly restaurant reviewers left in Los Angeles, one of the world’s great food cities. So I decided to write my own reviews. Read the rest on this site, and don’t forget to sign up (and share with your friends) to get weekly reviews to your in box.